Update 4th October 2008: Ashtami is on 7th Oct. This is the day of “KANJAK” when 1,or 3,5,7,9 little girls are fed with halwa, puri, kaala channa, potato curry and boondi raita, along with either a chunri or cash. Symbolic of the nine av tars of Mata Durga, we worship the girls by washing their feet, tying a mauli around their wrists and they in turn apply tikka to the head of the family and tie a mauli around his wrist. Cannot control some morbid thoughts that overtake my senses. Its all very well to worship your own daughters or those of others, even a servants child, on a festival such as this all in the pious (?) 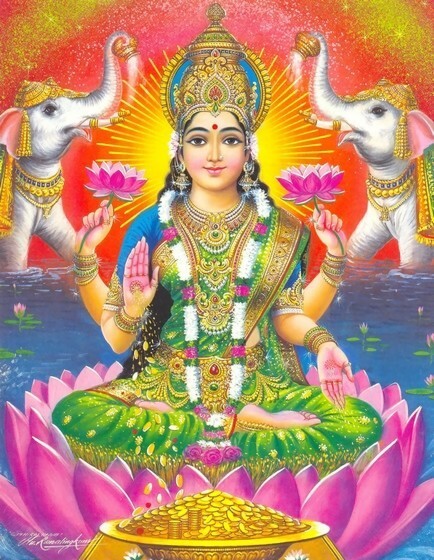 hope of winning over Mata Lakshmi and invoking her blessings. But the other 364 days of the year are spent either aborting a female child or burning brides or selling ones daughters into prostitution. What a bunch of criminal hypocrites we Indians can be…!!! Okay.. I am done now with my rant. Its time again..One of my favourite festivals Navratri or nine(nav) nights (ratri) spent in propitiation, music and dance,commences today. “Mother” as Goddess in the form of Durga, Lakshmi and Saraswati, is worshipped as the primal source of energy. Colour, revelry and festivity take on a tint unparalleled with any other Indian festival . “Durga Puja’ in Bengal , corresponds with Navratri elsewhere. Ma Durga is worshipped for nine days, and immersed on the tenth, after having, as legend goes, vanquished the demons or ‘rakshasas’. Perhaps this is meant to subtly advise us to conquer the demons of anger, jealousy, pride, greed and seek Mother Durgas help in doing so. “Garba” or “raas” as dance forms are pre-dominantly Gujarat centric. However, now that Navratri has grown to become one of the most awaited festivals nationally, garba and raas too have joined the ranks of popular dance forms, as Bhangra. Just how innovative were our ancestors can be gaged when analysing the origins of ‘garba’. Update 21st Sept 2008: Kavita Chhibber speaks with Troy just days before his scheduled execution. Guys its just too traumatic for words.. Please act now!! Click on link at Kavitas site.. Thanks!! Kavita Chhibber sent me this piece pasted below, written passionately elaborating how an innocent man is doomed to execution on 23rd September. Troy Davis’s case and his subsequent plea for clemency has taken Georgia by storm, with various organisations, citizen groups even songs being dedicated to espouse the cause of saving his life.Time is running short. Troy Davis..In his own words. .painful!! Read on and write to the parole board..link provided in the article. Thanks. His name is Troy Anthony Davis and he is a Black man from Savannah Georgia on death row for close to 20 years. I’m neither pro nor anti-death penalty. I believe it should be decided on the case by case basis. And this is one case where I believe that this man does not deserve to die. This is a story of what can possibly happen to you and me if we were to end up in the wrong place, at the wrong time. Add a screwed up legal system, and a dash of racism, and it could be a life in a maximum security prison, with years of no redemption. A rare sense of humor displayed on hoardings at Bandra these days..bound to evoke a giggle.